← Say YES to Yoga this Summer! Hemma Open House & Moss Street Paint In!!! 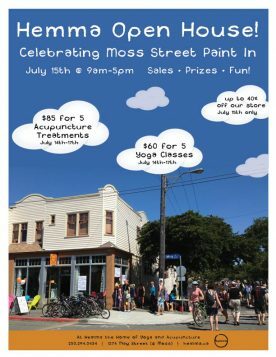 Come down and join us on Saturday July 15th to celebrate the 30th annual Moss Street Paint-In, Vancouver Island’s largest outdoor visual art event! One of the best community events in Victoria, the Paint-In stretches from the Art Gallery to Dallas Road, along May Street, and features nearly 200 professional and emerging artists, fantastic food, and fun for the entire family. If you have not experienced this community-focused event, you have to come this year and join your neighbours and friends and the other 35,000 people! We’ll be celebrating too, with an Open House — including SALES, prize draws and more throughout the day — and on top of that, Yoga and Acupuncture passes will be on sale from the 14th to the 17th! So remember to stop by and say hi as you stroll down Moss Street, have some tea, and take advantage of some great deals! Up to 40% off every single thing in our store on July 15h! Your sale is as unique as you and will be determined by random lottery. Come play! From 11am-4pm, drop in for an outdoor Acupuncture. All treatments are by donation to the Red Cross’s BC Fire Relief Fund. We will be open for our regular Yoga and Acupuncture schedule on this day, so make a plan to check out the Paint-In, which runs from 11am to 4pm, before or after. Please consider biking / walking / and arriving early as parking in the area will be limited.